The solicitation was released last week for The Fury of Firestorm: The Nuclear Men #8 shipping in April. With all the excitement of issue #5 coming out this week, we haven’t had a chance to talk about this solicitation yet. Check out the gorgeous cover and the intriguing solicitation copy below. Jason Rusch rockets to Europe to thwart the next Rogue attack, only to find that other Firestorms have beaten him to it! Introducing the all-new Firehawk, France’s own atomic defender, and Hurricane, Great Britain’s officially sanctioned Nuclear Man! Meanwhile, out of the ashes of last issue’s shocking climax, Ronnie Raymond and the Russian Firestorm, Pozhar, begin a long, mutual descent toward the dark underbelly of the Firestorm Protocols. New cowriter Joe Harris (Ghost Projekt) continues this acclaimed series with superstar artist Ethan Van Sciver, who provides another stunning issue of full interior art! Wow! Joe and Ethan are really taking things up a notch! First off, what an amazing cover! Firehawk, Hurricane, and Jason look fantastic! I’m dying to learn more about these new Firestorms. I really dig the way the Great Britain flag was worked into the Firestorm costume design. So cool! And the new Firehawk is beautiful and off-putting at the same time. Interesting. Personally, I’m speculating that Firehawk will NOT be Lorraine Reilly, and that Hurricane will feature some nods to the old Firestorm villain Typhoon. Just my current guesses. We’ll have to see! 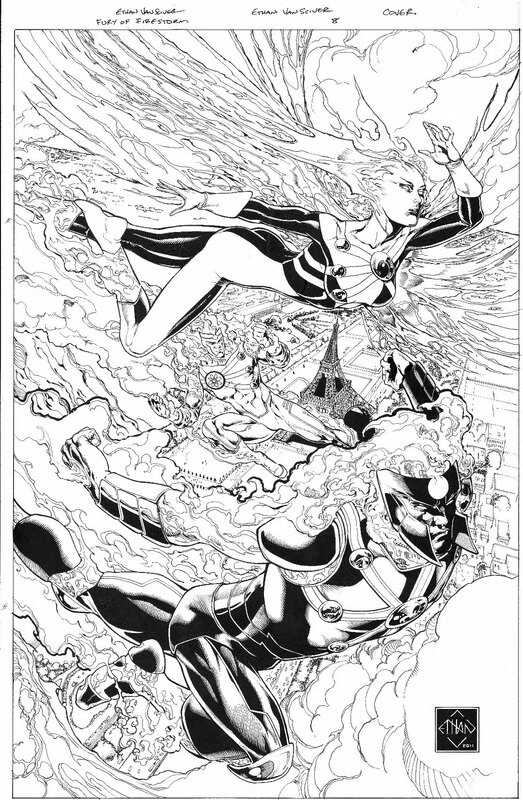 Below are the pencils for Ethan’s cover to issue #8. Such an amazing amount of detail! Click the image to enlarge. 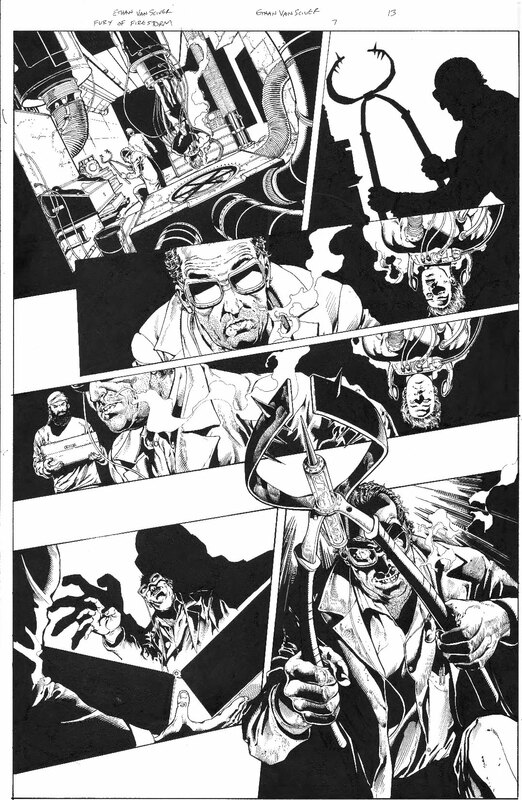 Below is a page from The Fury of Firestorm: The Nuclear Men #7! Click to enlarge! I’m really enjoying the current issues of Firestorm, but I’m also getting really anxious for issues #7 and #8! Can’t wait! Posted in: Comic books, Ethan Van Sciver, Firehawk - The New 52, Firestorm #09: New 52 v1 (Firestorm Protocols), Firestorm comic vol. IV, Joe Harris. Okay, I’m pretty stoked to see Firehawk again, even if this is a new version! I might actually skip through grass fields with glee if they can manage to mix characters like Killer Frost, Brimstone and Tokamak into this new take on flamehead! Holy cow… the guy with the glasses looks like it could be Martin…. 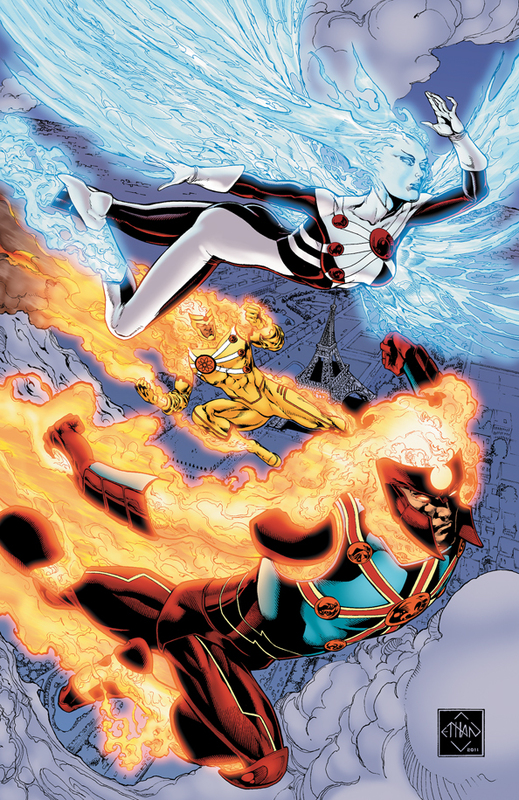 The bottom Firestorm looks an AWFUL lot like Sunfire. Just sayin. . .